Another Wednesday, another Gotham recap. While this week's episode, "Stop Hitting Yourself," is absent of Professor Pyg, it still shows the fallout from his actions last week and the GCPD's reaction. The Narrows are outraged at Penguin for sending both the GCPD and his thugs to shake them down, and it looks as if Harvey's under fire for his part in the debacle. Warning for spoilers and violence (particularly of the loss-of-limb variety). Plot A: Nygma and Grundy vs. the Sirens. 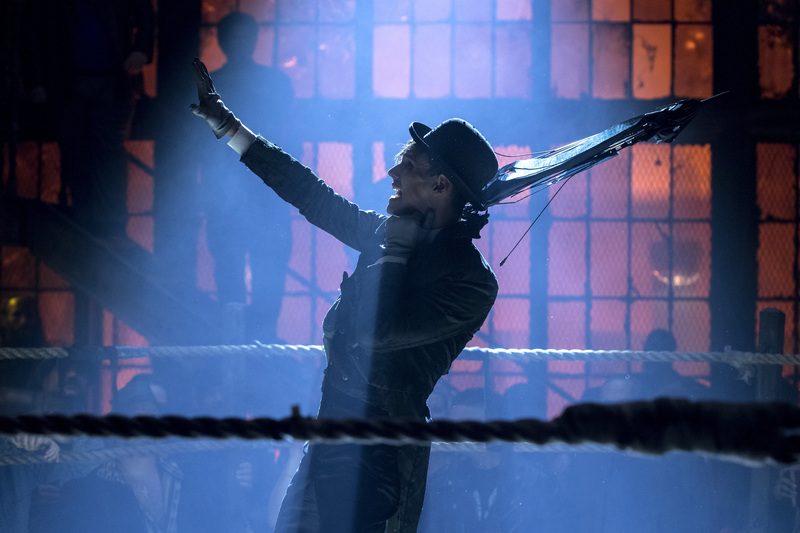 The episode begins with Nygma putting on a show at the fight club. He's dressed up as Penguin, complete with an umbrella, fake nose, and clownish children dressed up as GCPD lackeys. "Penguin" scolds the crowd for booing him and says he'll sic the cops on them. However, Grundy arrives to "defeat" the fake-Penguin. Despite his brain problems, Nygma's act is pretty smart: it stokes the Narrows' growing resentment towards Penguin and gives them even more of a reason to enjoy watching Grundy, as the latter is presented as their champion. After his role as the Penguin is over, Nygma dons a spectacular suit. Like, Jim-Carrey-Riddler-eat-your-heart-out spectacular. Cherry then steps in to announce the next fight, which will feature Grundy and a new challenger: Mr. Murderface (no, I'm not kidding). As the fight begins, Nygma walks over to Lee. She tells him that his act is only going to bring trouble to the Narrows, but Nygma says that if Penguin comes for him, he'll have Grundy to protect him. Lee points out that Nygma and Grundy's fans won't be safe, but Nygma says that he's not going to stick up for the Narrows and points out that she's not about to either. Meanwhile, Butch briefly has a flashback of Tabitha before shutting it out. He then rips off Mr. Murderface's arm and beats him with it, causing the crowd to chant: "Stop hitting yourself, stop hitting yourself!" Over at the Iceberg Lounge, a member of the gang the Sirens robbed complains to Penguin. Babs offers to smooth things over by splitting the money with Penguin, but before they can reach an agreement, Mr. Penn arrives. He tells Penguin about Nygma's act, which causes Penguin to have a supreme meltdown. Selina thinks that it's funny and actually laughs at him. Penguin laughs in return, but when the gang member joins in and jokes about the Riddler, Penguin has a nasty reaction. Penguin says the Sirens now owe him the same debt they owed the gang. They can pay it back by catching Nygma and bringing him to Penguin. Selina says the that the Sirens aren't his stooges and should get something in return. He replies that their reward will be him not setting every criminal in the city loose on them. Babs accepts the offer, and the Sirens head out. After they leave, Penguin tells Firefly to follow them to the Narrows and burn the entire fight club down (along with the Sirens) if they fail. She seems pretty on board with the idea, which is a bit sad, since it probably means the writers gotten rid of her friendship with Selina. As the Sirens enter the narrows, Selina explains that the fight club is about more than just winning matches to make cash; it started out as a way for the people of the Narrows to settle disputes. Babs and Tabs seem happy to get revenge on Nygma, with the former assuming it'll be an easy job now that his IQ's gone down. The Sirens enter the club and watch Nygma's show in action. Babs is sidetracked by Lee's presence and decides to see what's up with her, whereas Tabs is ecstatic to see Butch alive again and immediately decides to find him and get through to him. As the two head their separate ways and leave her alone, Selina grumbles that she's the only one actually focused on the job. Tabs tries to talk to Grundy, but he doesn't recognize her. Meanwhile, Babs chats with Lee, who pistol whips her across the face in a very satisfying move. Babs brushes it off and explains she's here on Penguin's orders. Lee calls Babs a "flunky," but Babs points out that Lee's not moving up in the world either. Lee says she didn't come to the Narrows to help herself. Babs wonders what Jim thinks of Lee's new life, but she replies: "Jim who?" Babs mentions that she's just at the fight club for a kidnapping, which makes Lee realize Nygma's in trouble. And boy, is he. Selina gets the drop on Nygma in the locker room and ties him up. Babs thanks her, but Selina snipes at her for not being professional. Also, just as Tabs seems to be on the verge of a breakthrough with Grundy, Babs and Selina show up with Nygma. Nygma tries to sic Grundy on them, but Lee rushes in to stop the fight. Selina offers a way to settle who gets Nygma: a good, old-fashioned Narrows showdown in the ring. He then announces Tabs, calling her "Tabby the Tigress." (I can't believe it took two whole seasons for someone to give Tabitha her codename, and there's no explanation. I mean, I'm not mad, but it's still a little weird.) Tabs enters the ring, confident that she can make Grundy recognize her. From the crowd, Lee explains to Cherry that Tabs and Butch used to be in a relationship. Cherry says Grundy will win, like always, but it doesn't matter. Either way, she says, the Penguin will still get Nygma. In the ring, Tabs tries to talk Grundy into remembering her, but it doesn't work. He drags her around before she uses a spiked bat passed to her by Babs. She fends Grundy off with it, and he begins to see flashes of their past. He even asks "Tabby?" right before she knocks him out with the bat. Tabs, shocked, realizes what she's done and tries to get him to wake up. Selina says they need to go, and Tabs promises Grundy she'll come back for him, but before the Sirens can leave, Firefly arrives. She tells the Sirens they missed the deadline to bring back Nygma and begins to use her flamethrower. Grundy wakes up but is immediately frightened by the fire. Selina tries to talk Firefly down, asking why she would want to destroy the part of down she came from. Firefly insists that the place is like a sewer; it needs to be burned to get rid of everything that stinks. But before Firefly can make good on that ultimatum, Lee shoots at her, damaging part of her suit. But is Firefly dead? Cherry gets mad and tells the crowd that Penguin's going to be out for blood now. Lee points out that Cherry must've been the one who tipped him off to Ngyma's act in the first place. As the crowd gets angrier, Cherry tries to cast blame on the Sirens for working with Penguin, but Babs simply kills Cherry and announces that the Sirens aren't working for him anymore. The crowd cheers, and Nygma tells Grundy he's safe from Firefly. Later (presumably after the Sirens have left), Lee checks a confused Grundy for wounds, next to a smug Nygma. The people of the Narrows watch the three of them, which leads him to an interesting conclusion: they've got a new leader. It's possible that Nygma's just buttering Lee up because he wants an in with the new leader, but his words come across as very heartfelt. He has faith in her, even if they're not the best of friends. Lee insists that she can't lead, but he points out that if she doesn't step up, someone else will (and possibly someone worse than Cherry). He advises her to give them something to cheer for, so she declares drinks on the house. And it looks like she's actually enjoying it a little. Plot B: Oh, Captain, My Captain! Gordon gets called into a meeting with the mayor, who wants to make him the new captain. Gordon insists that Harvey's the captain, but the mayor says Harvey screwed up and shouldn't have worked with Penguin. Gordon points out that the mayor is also in Penguin's pocket. The mayor says that either way, someone will replace Harvey, and they may not be as well-intentioned as Gordon. He pushes Gordon to take the contract and think about it. All he has to do to become captain is sign. Back at the GCPD, Harvey looks at a row of bullets in a case. Gordon arrives and lies that he got stuck in traffic. Harvey shows him the bullets, explaining that they're slugs pulled out of the cops that got wounded in the narrows. Gordon says they need to move on and focus on catching Pyg. And for one, shining moment, Lucius Fox appears . . .
. . . but only to tell them he hasn't been able to find any useful evidence at the crime scenes. Harvey then asks Gordon to go the the Bullet Hole Club, and the latter agrees. Lucius asks what he means, and Gordon explains that it's an informal group for cops that have been shot in the line of duty. It's the commanding officer's job to present each one with the bullet(s) that wounded them. 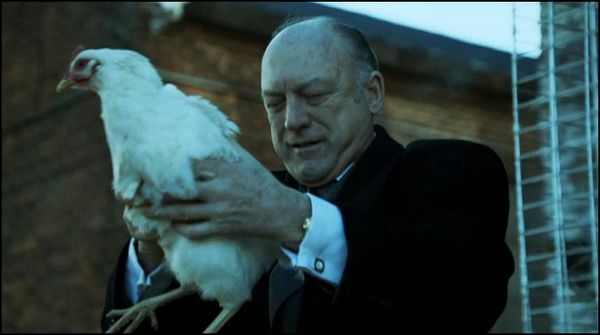 Gordon later asks Sofia how he could've been promoted, since Penguin would never let that happen. He realizes that she was behind it, and Sofia replies that all it took was the Falcone name. Gordon says this isn't the way he wants to get the job and he doesn't want to hurt Harvey, but Sofia insists that Harvey is weak and incompetent. She tells Gordon to stop pretending he's going to turn down the job—if he was, he'd already have gotten rid of the contract. Later that night, the Bullet Hole Club commences at a local bar. A barmaid passes Gordon the case of bullets, left for him by an absent Harvey. Gordon gives each cop their bullet, including a female officer now in a wheelchair after Harvey shot her by accident. As Gordon presents the bullets, a sad, yet heroic theme plays in the background, the same one that underscores Bruce's decision to leave Wayne Manor in season 2. I wouldn't mention it, except that I think Gotham's score deserves more recognition. Gordon then returns to the GCPD, where Harvey drinks alone at his desk. Gordon says the cops were waiting for him, but Harvey says they would've "spat in [his] face." Gordon insists that Harvey owed it to the officers to look them in the eye and that if he'd been there, he might've earned back their respect. Harvey says he doesn't deserve it, but Gordon counters that it's the captain's job to take responsibility. Harvey says he sent Gordon to do the job because he couldn't. His resigned attitude is the final straw for Gordon. He grabs a pen and signs the contract before displaying it to Harvey and announcing that the latter is relieved of duty. Harvey sarcastically congratulates Gordon but says he had to have done something to get the position. Gordon says he only did his job, but Harvey bitterly warns him that "Nothing in Gotham is free." Gordon takes the words to heart and tells Sofia he doesn't want to be her puppet. She replies that they're partners, but he says he just backstabbed his partner. Sofia says that "Harvey had to go." Gordon tells her that he doesn't want her help anymore and she needs to leave Gotham. Sofia replies that she's sticking around for good to restore the Falcone name. She then invites him to celebrate with her, but he declines, electing to stay outside "where [he] can breathe." Or, to put it another way: Gordon just realized he's in over his head. Plot C: Not all male penguins should be left to raise the young. After learning about Nygma's act, Penguin rants to Sofia at the orphanage about how hard it is to be a crime lord. He asks her to lunch, but she needs to speak with caterers about a fundraiser. She tells Penguin he needs a different way to relax when she's not around. The answer? Chickens. Sofia explains that the chickens her father cared for were a way of taking his mind off of business. Unfortunately for fans of Batman: The Animated Series, Penguin does not immediately buy a flock of chickens, or any other birds, for that matter. However, after Sofia leaves, he spots one of the orphans being bullied by the others. The boy runs away, only to produce matches and gasoline. (Seriously, who watches these children?) Penguin yells at him to stop. The boy, who seems to only speak through pictures and written words, explains that he meant to set a fire. Penguin says he can't do that. Why? Not because arson is bad, but because the bullies would know it was him. Penguin later coaches the kid through revenge and hints that friendship can be a good vehicle for vengeance. The boy mentions in his notes that the bullies are flunking math, but he's good at it. He ends up using this to his advantage. During a test, he lets a strong-looking girl cheat off of him. In return, she protects him from the bullies and beats them up for him. Penguin tells the boy that minions are better than friends. The boy writes that the two of them are friends, but Penguin insists that they're not, as his last friend betrayed him. Instead, they're co-conspirators. Still, as the boy walks off, Penguin looks at the note with a touch of regret. Sofia later walks in on Penguin teaching the boy (Martin, apparently) how to stab. Penn arrives and tells Penguin that not only did the Sirens and Firefly fail to retrieve Nygma, but Gordon is now Captain of the GCPD. Penguin struggles to remain composure, and Sofia tells him that business is not the end-all be-all. She points out that there are other important values, such as friendship, and asks if he's coming to dinner. He turns her down and says he has more to teach Martin. After Sofia leaves, Penguin confides a cruel fact to Martin: "Sometimes, if you’re not very careful, friendship can blind you to what is staring you right in the face." As he says this, he watches Sofia from the window. Plot A: When I heard that a big part of this season was going to be the dynamic between Grundy, Nygma, and Lee, I thought it was the craziest thing I'd ever heard. Think about it: a dumbed-down supervillain joins forces with a zombie and a washed-out medical examiner, both of which are his former enemies. How could that possibly work? But it works. Oh, it works. This episode showed how the situation brings out different sides of each character. Grundy's rise to fame has brought out the theatrical side of Nygma, proving that he's still a showman, even if he's not quite the Riddler at the moment. Penguin and Cherry's oppression of the Narrows brings out Lee's desire to help people, even if that means stepping up in ways that are new and uncomfortable. If I had one qualm with plotline, it's that I'm not too invested in Grundy. Still, his sad, braindead state brings out the tender side of Tabitha, which is nice to see. However, I'm even more excited to see Lee's rise as leader of the Narrows. Plot B: Again, this was another plot I wasn't looking forward to. Gordon and Harvey's friendship is one of the best relationships on Gotham, so I wasn't excited to watch it fall apart. And yet, I think that's what needed to happen. Gordon needs to step up, and last week's episode proves that Harvey is a less-than-ideal leader. I was also glad to see Gordon realize early on that he needs to cut ties with Sofia (Will it last? No clue). Also, I love the parallel of Gordon and Lee stepping up to fill the leadership roles that no one else can. My only complaint? Not enough Lucius Fox. I love Chris Chalk in that role so much, and it felt like a cheat to have him only on screen for expositional purposes. Still, I'll take what I can get. Plot C: While I didn't care too much about Martin's petty revenge story, I was happy to see that Penguin's catching on to Sofia's ulterior motives. Is that reveal part of her larger plan? Maybe, maybe not. Either way, it should lead to an interesting conflict. I'm really curious to see what Sofia's overall gambit is, outside of just using Gordon and Penguin. Overall, this was a pretty solid episode. Bruce Wayne was absent, but I didn't care this time. There's only so much teen angst I can take, and I'm still reeling from his actions in the last episode.